Each piece created for Myrrhia Resneck’s Spring and Summer 2014 line has a story woven into the fabric. Coming from a family dedicated to the fashion industry and having been raised in the eco-conscious town of Santa Cruz, Resneck imbues her collections with a sense of tradition and responsibility. This season’s collection features Lenzing Tencel as well as un-dyed, organic California cotton grown only 90 miles from the company’s base in Oakland. Supplied by Vreseis Limited’s Sally Fox, the entomologist-turned-farmer has been raising sustainable threads for decades. For Myrrhia Resneck and Sally Fox, using sustainable fibers perfectly adheres to their commitment to producing local, quality clothing that supports the community and environment. Realizing that the planet and people who live among pesticide-saturated textile crops cannot wait for legislators to make wise decisions, the pair started their businesses with the intention of changing the status quo. Fox began breeding and growing organic cotton in 1985. Since its founding, Vreseis Limited and the Veriditas Farm have expanded to incorporate 140 Merino sheep, heirloom Sonora wheat, cotton, and biodynamic agriculture. 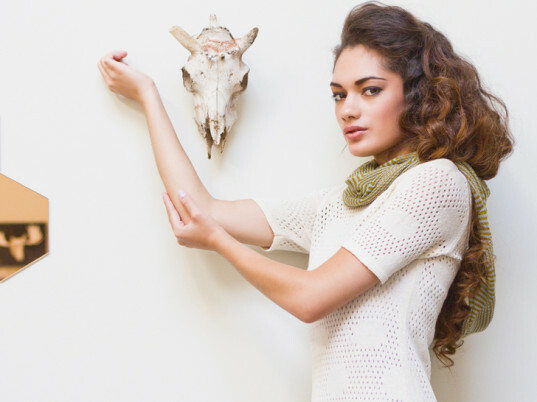 Using her crops as a link between the Earth and human culture, Fox believes that her products can remind the wearer of their connection to the land. “I simply cannot stop hoping and believing that we CAN clothe our homes and bodies in ways that enrich and nourish our earth. I continue to feel strongly that we can, with the same ingenuity that others have used to use up the earth’s resources, heal our planet and ourselves. I see bright hope growing so strongly in the youth of today.” Fox told Ecouterre. This year, Resneck builds upon the success of last year’s collection with the introduction of richer, more neutral colors and daring shapes. Several pieces feature cuts that channel the energy of “rebellious biker and punk culture” blended into more feminine profiles. The Consciously Created Collection aims to channel the activist and changemaker mentality of strong women who, like Resneck and Fox, bring their talents to the realm of fashion, social justice, and ecological sustainability. Using the power of style to demonstrate the ethos of responsible business and ethical consumption, the collection hopes to give the women it empowers the courage and confidence to make positive changes of their own. Each piece created for Myrrhia Resneck's Spring and Summer 2014 line has a story woven into the fabric. Coming from a family dedicated to the fashion industry and having been raised in the eco-conscious town of Santa Cruz, Resneck imbues her collections with a sense of tradition and responsibility. This season's collection features Lenzing Tencel as well as un-dyed, organic California cotton grown only 90 miles from the company's base in Oakland. Supplied by Vreseis Limited's Sally Fox, the entomologist-turned-farmer has been raising sustainable threads for decades.